Did you know October is National Cookie Month? I didn't until we visited the library a few days ago and they had a table display of kid's cookbooks laid out (just for us, I'm sure) and we picked just a few! We didn't make cookies but we did read through the whole book cuddled together in our comfy chair. Wednesday night after she thumbed through it again she found a recipe she really wanted to make and said in her sweetest voice: "We have all the ingredients! It will be so simple." I'd already made a pan of our favorite eggplant lasagna for dinner and wasn't looking forward to more time not relaxing after dinner but after I perused the recipe I agreed. I couldn't resist her or the recipe. Could you have resisted? 1. Pop the marshmallows into the freezer. 3. To make the cake, melt the butter in a bowl at 50 % power in the microwave (about 1 minute). Use a whisk to stir in the sugars. Cool slightly. Stir in rest of ingredients for the cakes (so not the Goosh) until smooth. Spoon into four ramekins or baking cups, filling 2/3 full. Put a cold marshmallow in the middle of the cake. 4. To make the Goosh, put the ingredients in a cup and heat at 50% power in the microwave, until hot. Stir smooth. Pour over the marshmallows and cake batter. 5. Put the ramekins or cups on a baking sheet. Bake 23 minutes or until puffed, the chocolate is bubbling and the marshmallows melt into top crusts. Cool until warm. Don't unmold. Eat it right up! You could lick your bowl but you might get your nose stuck in the ramekin! I would have taken my own photo of them but I couldn't find my camera fast enough and then... they were gone. 6. candies, confections and cool treats. You can see where the emphasis is; kid-friendly sweets. Low also provides an interesting section on organizing the kitchen for your child, tools and measuring instructions. We liked the Paddy Thai Noodles from the first section, the big soft pretzels from the second section, alphabet cookies from the third section and candy marbles from the last section. Most recipes don't include as much microwaving as the s'mores cakes, which is good because I'm a little weird about using the microwave too cook. Many recipes in the book are done in smaller sizes or kid-sized. This is definitely one book you will want to read the recipe through before making something just to make sure you will have enough. I'm pretty sure we'll make a few more recipes before we return it to the library. 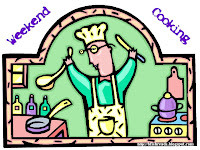 Weekend Cooking is hosted at Beth Fish Reads. Stop over there and find many other food-related posts.